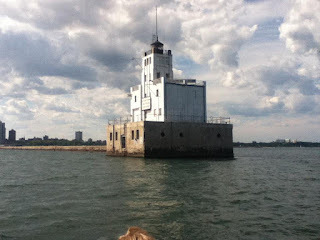 This is a photo of the Milwaukee Light house, so many fond memories and I love the design. There are times in my life where I almost miss a month of blogging (the only goal that I have for this place or thing is to post monthly). This month has almost been missed, but today I will rectify that, as it is now time to reflect and catalog. First, I successfully defended and filed my dissertation at UCSB. That was a 5 day event in Santa Barbara. After the defense, I got to spend time with Luke Thomas Taylor (the other half of Lopher), several evenings of celebration including Clarence's end of the year party. I returned home to a wife who was quarantined due to illness, so I had to hang out on the boat. The successful defense lead to being expelled from the academic machine. The expelling ceremony was a weekend in Santa Barbara with my dearest and my parents. My parents arrived a on Wednesday and spent two nights on the boat with me. We even went sailing, the first time I have sailed with either of my parents. On Friday we picked up the now healed Christine and headed down to Santa Barbara where we had a vacation rental for the weekend. Going out to dinner with Clarence Barlow, Curtis Roads, Christine and my parents was a really amazing experience. The ceremony happened and we drove back to Palo Alto. Three days of moving boxes ensued, as my parents graciously assisted with the moving. The following weekend Christine's parents came out for her graduation from residency, even though she had two weeks left to work. Again, some sailing with the parents. It was also her parents wedding anniversary, so we headed down to Monterey for a dinner overlooking the ocean and a general tour of the area. Graduations complete, this left us with a single week to get out of the apartment. I put everything together and got as much as I could together. Nathan graciously came up from LA to spend 4 days helping me move the final collection of belongings to a storage unit (the pile that resulted is an amazing sculpture/puzzle). Christine was forced by Stanford to work the weekend to make up time for what she missed 3 weeks earlier. Nathan and I got out for a sail and got everything out. Since that time it has been non stop boat projects, as we prepare to sail to Mexico. The trip will begin on August 15, 2012 and we plan to go from town to town as we work our way down the coast, eventually reaching the Sea of Cortez, turn around and haul it back up to the Bay by January 1, when Christine starts a fellowship at Stanford. Life has been a series of phone calls (or arguments might be more appropriate) and working on the boat. SO many projects to get her ship shape. All the while, my dearest is studying for the biggest test of her life, which she takes on July 31. So, there it all is, minus a great deal of minutae and there is more to come as the sailing adventure ensues.